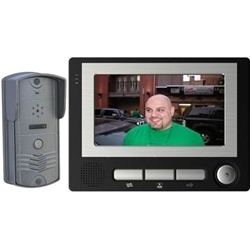 With the video door intercom kit, you will be able to see and speak to whoever comes to your door while within the safety of your home or office. The person at the door is hands free while talking, so there is nothing confusing for visitors to use. Monitor an entrance by sight and sound - Simply hit the monitor button to view and hear everything at a specific entrance.